Welcome to the MMA Simulator Press page. 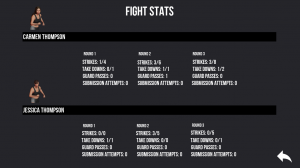 Here you should find any info you might need to post articles or get more informed about MMA Simulator. If you need any additional information posted to this page or would like anything provided in a different format, let me know and I’ll make it available. Platforms: Windows – Linux and Mac versions are planned in the future. 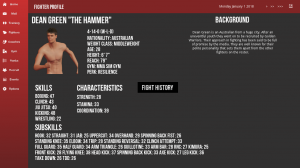 MMA Simulator is a text based simulation of running your own gym of MMA fighters in different organizations. Text based, detailed, and realistic combat is what MMA Simulator excels in. Fights can go anywhere a real fight does – Standing, Clinch, and Ground. Positioning matters and submissions go through several stages depending on their complexity. The dynamic is completely different between two fighters! Managing a gym means everything from picking the best location to expanding in size to accommodate more fighters, and manage buying equipment to help your fighters train. The fight game is rough. Ensuring your fighters stay healthy and happy is crucial to taking your gym to the top. If fighters get injured in training or fights, they may be out of commission for a while! Ther are over twenty injuries that take similar time to heal as they do in real life! Fighters also age and their performance will lessen as they get older. Every game is guaranteed to be different as fighters, coaches, and gyms are generated on the fly. Each one is unique. Zever Games was founded in December of 2017 by myself as a solo endeavor to create a full sized game. After creating a couple of small Android games I decided I wanted to tackle a bigger challenge. 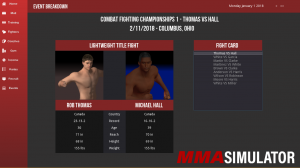 A few days later, I came up with the idea of an MMA simulation game, it didn’t sound that hard (haha!) and I was off to the races. I built a quick mockup over the next week and submitted a post to Reddit….which to my surprise got a HUGE response of interested people. Ever since then most of my free time has gone into MMA Simulator. It has come a very long way since in terms of gameplay and technical hurdles I had to jump to get it to release. Now it is in the final stages of beta before release on September 25, 2018.